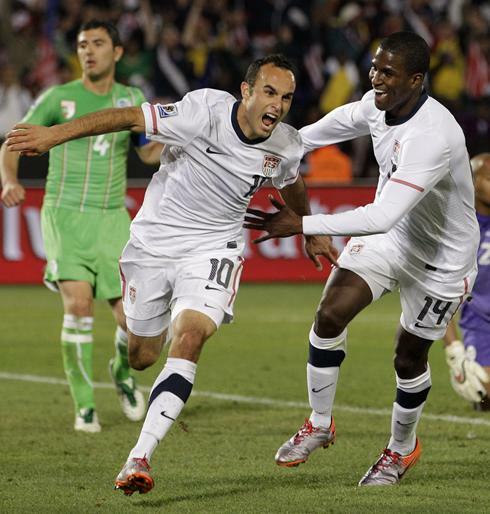 Team USA's Landon Donovan celebrates his late goal against Algeria with teammate Edson Buddle. The Americans finish first in Group C after their 1-0 win and will play Ghana in the Round of 16 on Saturday. PRETORIA, South Africa — After so many shots sailed over the goal, after a few ricocheted off the post, after so many missed chances, the team that seemingly can't play 90 minutes without drama did it again. In the 91st minute. Afterward, it was called the biggest win in team history. It certainly was the most exciting. Landon Donovan's goal gave the USA a 1-0 win against Algeria on Wednesday and sent the Americans to the second round of the World Cup. The team took first place in its group for the first time in 80 years and will face Ghana on Saturday inRustenburg. "This team embodies what the American spirit is about," Donovan said. "We had a goal disallowed the other night. We had another good goal disallowed tonight (on an offsides call), but we just keep going, and I think that's what people admire so much about America." The decisive play took 12 seconds to go from end line to end line, from Tim Howard's gloves to the back of Algeria's net. After an Algeria shot on goal, Howard gathered the ball 33 seconds into stoppage time and threw a perfect strike to Donovan streaking down the right sideline. The ball went from Donovan to Jozy Altidore to Clint Dempsey, whose shot bounced off the goalkeeper. Donovan was there, waiting for the rebound, and he punched the ball into the left side of the net. "The moment kind of slowed down for me," he said. "It was as much a reaction as anything." Afterward, U.S. Soccer President Sunil Gulati put the moment in perspective. "The is the biggest win we've ever had for so many reasons," Gulati said after the Americans' first World Cup win in eight years and first-ever in their third group-stage game. "One is obviously the passion in which it happened. And the second is the overcoming of adversity not just today but the last game. And three, most of the country was tuned into the game" whether on TV, online or Twitter. Throughout this World Cup, the U.S. players tapped into their well of resiliency, time after time. In their much-anticipated opener against well-heeled England, they fell behind in the fourth minute and came back to even the match 1-1 thanks to an epic gaffe by England's goalkeeper. In their second match against Slovenia, the Americans were down by two goals at halftime but fought back for a 2-2 draw, thanks to goals by Donovan and Michael Bradley. The U.S. goal that was inexplicably waved off in the 85th minute that day is what many will remember, given the outrage it prompted back home. That draw kept the team's hopes alive heading into the Algeria match. Win, and advance to the next round. Lose, and go home. Tie, and hope for the worst for England. For Algeria, only a win would get it through. As the team bus approached the stadium Wednesday, the street was lined with fans. "Waving flags, dressed up, chanting USA, knocking on the bus," coach Bob Bradley said. "We don't always have that. To have that happen at the World Cup, in South Africa, I think that was a really special feeling. To finish the night with a great win to go with the kind of support we do have, that shows we're making big steps." On this day, in the capital of South Africa, the city where Nelson Mandela was inaugurated as president in 1994, Pretoria seemed more like Peoria. Much of the crowd of 35,827 was painted in red, white and blue. There was a fan with a life-sized Barack Obama cardboard cutout dressed in a Bafana Bafana shirt. Former U.S. presidentBill Clinton sat in the stands, biting his thumbnail during tense moments. U.S. football even crossed over to world football withReggie Bush in the house, blowing a vuvuzela with gusto. A wide-open, end-to-end game in the opening minutes set the stage for the anxiety to follow. At the start, it was so tense in Loftus Versfeld Stadium, even the vuvuzelas sounded nervous. England kicked off against Slovenia at the same time. When England scored in the 23rd minute, the tension increased. If that result held, which it did, the USA would need a win to advance. At halftime, the players were told of England's 1-0 lead. "We knew we needed to win, and we weren't going to wait on anyone else to do it for us," said Dempsey, who took an elbow to the mouth late in the game and needed four stitches afterward. In the second half, Bradley made several substitutions, then used three forwards to push for the elusive goal. Of course, the Americans had plenty of chances, with 22 shots, most wide right, wide left, way high or stopped by a standout keeper. One that went in on a strike from Dempsey at the 20-minute mark was disallowed. "I didn't think I was offsides," he said. "When I shot the ball, I made sure I was even." Said Donovan, "Sometimes in soccer you have games like that, where you get a lot of chances and they don't go in." Finally, when it did, Donovan ran toward the field's left corner and slid headfirst across the turf. Soon, he was buried under a pile of teammates. Dempsey, then Altidore, then almost everyone else. The pile grew so high that by the time defenderJay DeMerit arrived, he had to do a somersault over the top to join the fun. "That's something I'll have embedded in my mind forever," Donovan said. At the other end of the field, Howard jumped so high, it seemed he might never land. "We're kind of like the cardiac kids at the moment," Howard said. "That emotion, that passion is what American sports fans thrive on. Given the American sports psyche, this is probably going to be more amazing for them than if we played unbelievable and won 3-0." Raucous cheers erupted on the floor of the New York Stock Exchange and even in the White House when Donovan scored, Gulati said, according to e-mails he received. In the 45 minutes Clinton spent in the locker room with the Americans after the game, he told them how proud their country was of them. For the ride to continue, for the Americans to reach the quarterfinals as they did eight years ago, they must beat Ghana, the team that knocked them out of the 2006 World Cup in their final first-round game. Donovan has waited and worked for this moment ever since then. "I've been through a lot in the last four years," he said, as tears filled his eyes. Bradley, sitting next to him in the postgame news conference, patted his player on the back as Donovan composed himself. "I'm so glad it culminated this way," Donovan continued. "It makes me believe in good in the world, and when you try to do things the right way, it's good to see them get rewarded." The lowest points came after his disappointing 2006 World Cup, in which the USA exited without a first-round victory, and his separation from actress Bianca Kajlich last July. "Those experiences can harden you and help you grow if you learn from them and if you look at them the right way," he said. "I've spent a lot of time and done a lot of work to get something out of those experiences, and I think it all came together tonight." Helped by therapy and his ex-wife, Donovan said he entered this World Cup in a very different place. He acknowledged the person who helped him get there in the postgame interview on the field when he said, "Hi, Bianca," and blew a kiss to the camera. "I've carried her with me through this tournament and she's been a part of this with me, and I'm lucky to have her," he said later. When asked if there was a reconciliation in their future, Donovan cracked, "What is this, Access Hollywood?" Donovan reached this point by learning that being a leader isn't just about scoring goals and making assists. "Without a doubt, Landon has grown in so many ways," Bradley said. "From the soccer end, he mentions the low after the World Cup in 2006. But there was also the challenge of taking a bigger role, being more responsible as a leader. ... There's a special feeling when you play on a team where you know people are really counting on you. Your character, your personality is at the core of how that team does. Some players never experience that." For Donovan, that moment is now.